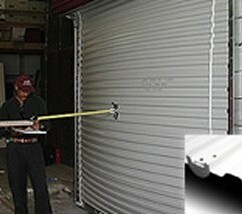 Austin Building Systems (BuildMetal.com) discounts the Janus Roll Up Door Series 750. Brochure and Installation Guide available below. Janus has achieved wind load certification with the Series 750 Door, which meets stringent wind load requirements for mini storage / mini warehouse applications while still providing the best door operation in the industry. • Minimizes the locking and reinforcement needed to strengthen the door to pass rigorous wind load testing. • Fewer friction points and less additional weight results in a door that operates better and still yields greater strength than any other available to the self storage industry. • Meets the requirements of the SBC (Standard Building Code) and ASCE 7 (American Society of Civil Engineers). The ASCE Standard is used in the Florida Building Code and the International Building Code. • Applicable opening sizes range from 3′ wide through 10′ wide, with the maximum height being 12′. • Locking device may be located on the curtain or the bottom bar. • Doors may be installed on steel, concrete, or filled block jambs. • All door sizes meet the wind load requirements of the interior and exterior zones for 100 mph SBC wind speed and 130 mph exposure B, ASCE 7 wind speed. • Higher wind load ratings are available for certain sizes and can be determined on an individual basis.